inception in 2009, winning multiple Emmy’s for ‘Outstanding Comedy’ and the Golden Globe for ‘Best Television Series- Comedy or Musical’. Although a loyal fan of the series, I’ve found my allegiance has begun to wane in favor for a newer, more fast paced American sitcom- Brooklyn Nine-Nine. Both shows fall into the snappy 21 minute sitcom category- an excellent time frame for binge watching. Each show has distinct and hilarious characters who find themselves in nonsensical plot lines. 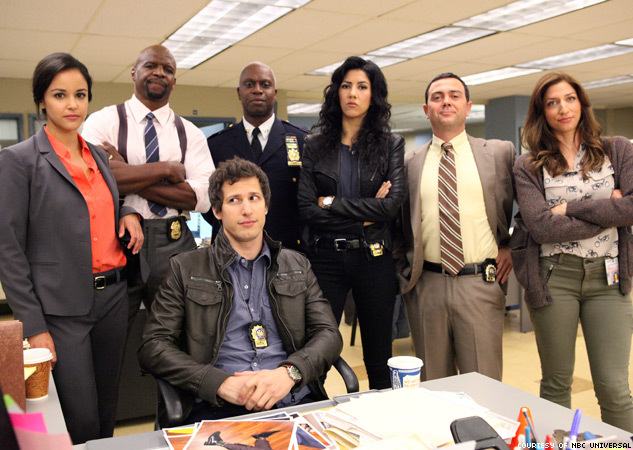 The setting varies – while Modern Family explores the relationships within the Pritchett- Dunphy-Delgado-Tucker in a Mockumentary style, Brooklyn Nine-Nine is set in a New York Police Precinct. But how does Brooklyn Nine-Nine stack up to Modern Family? The comedic plot of Brooklyn Nine-Nine is driven by Andy Samberg, who also produces the show. He plays Jake Peralta, a young NYPD detective with the resourcefulness of Luke Dunphy and the modesty of Manny Delgado. Peralta envisions himself as Bruce Willis in Die Hard, ignoring his “incompetent” coworkers to save the day single-handedly. His female counterpart and future love interest (stay tuned for Season 3) is Amy Santiago (Melissa Fumero)- think Hermione Granger meets Leslie Knope. With the competitiveness and intelligence of Alex Dunphy, her over achieving nature and eagerness to please Captain Holt (Andre Braugher) brings comic relief every time her actions are flirtingly mocked by Peralta. Paulson with the work ethic of Hayley Dunphy, Perolta’s enthusiastic sidekick, Charles, the unproductive Tweedle Dum and Dee-Scully and Hitchcock, and the tough and intelligent badass, Rosa Diaz. One of the great things about B99 is the way they mess with stereotypes, as each character presents unexpected quirks. Like Terry, whose body-building exterior intimidates you until he is too scared to shoot a gun and wants to go cuddle his twin daughters. Or Rosa, whose terrifying exterior is broken every time something like her history of Ballet is revealed. It’s not that Modern Family doesn’t do this. It does. However the characters in MF tend to fit their stereotypes, while delving deeper into what makes them tick (like exploring the highly amusing yet loving relationship between the elderly Jay and the youthful, vivacious Gloria). They also both deal with Gay Marriage and the stereotypes associated with it- Cam is frivolous and hysterical until farming or football is discussed, whereas the stoic and serious Captain Holt contributes politically, by creating the African-American Gay and Lesbian New York City Policeman’s Association (AAGLNYCPA for short). B99 also discusses the homophobia of the Police force in the 80’s and attempts to combat the continuing bigoted attitudes (nice right hook Peralta!). Despite this, it draws a nice line between featuring diverse characters, and rubbing their diversity in our face. The story lines of the shows also slightly differ. 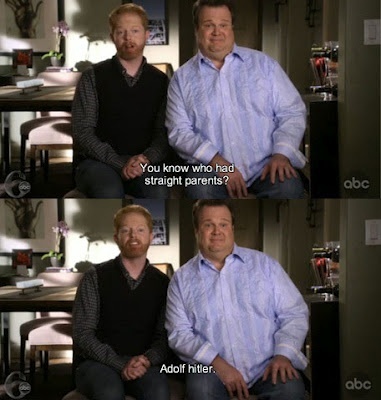 Modern Family tends to manipulate its Mockumentary format to show the hilarious contrasts in opinions of the family members. Contrastingly, Brooklyn Nine Nine avoids emotional conflict and focuses on the situational comedy found in the cop show setting. Halfway through its third season, Brooklyn Nine-Nine doesn’t seem as if its about to slow down. Having already established itself as a success with two Golden Globes in its first season, it seems its success can only improve. At the end of the day, past the dead bodies and drug busts, this show is essentially about family, and how working in a close environment can bring people together. This hilarious show, like Modern Family, has the ability to both make us laugh, and realise the importance of having a group of people who’re always there for you. I’ll leave this post with some of my favourite quotes from Modern Family and Brooklyn Nine-Nine.